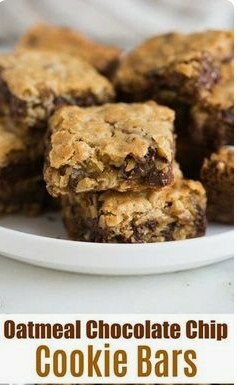 Oatmeal Chocolate Chip Cookie Bars are thick and chewy and a great treat for potlucks and parties. They have the flavor you love from a great chocolate chip cookie, baked into easy and delicious bars! 2 cups chocolate chips semi-sweet, milk chocolate, or a little bit of both! Preheat oven to 350 degrees F. Lightly grease a 9 x 13 in. pan with cooking spray. In a large mixing bowl beat together the butter, brown sugar, and white sugar until smooth and light. Add the eggs one at a time, mixing after each addition. Add the vanilla. In a separate bowl combine the dry ingredients: salt, baking soda, baking powder, flour, rolled oats, and 1 cup chocolate chips. Add to the butter mixture and stir until combined. Spread 1/2 of the cookie dough into the bottom of the prepared pan. Sprinkle remaining cup of chocolate chips on top. Carefully press remaining cookie mixture on top of chocolate. Bake for 25 to 30 minutes or until golden brown. Allow to cool completely before cutting. 0 Response to "Oatmeal Chocolate Chip Cookie Bars"